The Finance Department provides an array of services which include treasury management, central accounting, business tax receipt, revenue management, payroll services, utility billing, auditing, financial reporting, budgetary compliance monitoring, long-term financial planning and debt management. Technology allows the department to do more with less resources and to improve the delivery of our services by providing easier and faster access to relevant information. For this reason, our website offers the financial resources most commonly requested in one location. Accessible through the links provided above are a variety of financial reports and other important information. In addition, a variety of easy‐to‐use self‐service online tools are also available. If you cannot find what you are looking for through the links provided above, our staff would be happy to assist you. Financial excellence continues to remain a strong focal point for the Finance Department. 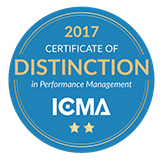 This fiscal year, the ICMA Center for Performance Analytics recognized the City of Palm Coast for the fourth year in a row for its performance management efforts with a Certificate of Distinction. 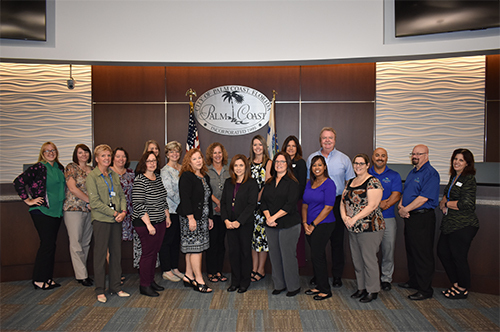 Palm Coast was one of thirteen to receive this level of recognition and one of 57 government entities nationwide to be recognized by the program in 2017. The Government Finance Officers Association (GFOA) Budget Presentation award was received for the 14th consecutive year. The GFOA Certificate of Achievement for Excellence in Financial Reporting was received for the 15th consecutive year. The GFOA Award for Outstanding Achievement for Popular Annual Financial Reporting was received for the 3rd consecutive year. Staff continues to look for ways to raise the bar on the level of service that is provided.